“New Year, New You.” Cliched and virtually invisible in its ubiquity, this over-used – arguably useless – marketing message is still (to my amazement) in rotation. A new year is not necessarily an opportunity for a new you. A new year is the passing of time that, in this case, happens to be positioned as a hard reset from our unpredictable lives, that sells a manufactured opportunity to assess one’s circumstances. And that’s why clichés exist – because we’re too lazy to think up an equally punchy way to say something more specific, meaningful and resonant. What it hopes to say is, it’s a new year, so you can reinvent yourself, and leave behind all those habits, people and situations that have dragged you down – that make you lesser than you want to be in some way. It’s a new year, so the aspects of yourself that you can’t stand anymore, the projects that haven’t been completed, the relationship that hasn’t been found, the body that disappoints you, can now (almost instantaneously) become a thing of the past. And because it’s a new year, ridding yourself of everything that traps you in an eddy of discontent is, now, even more urgent than it was just days ago. I don’t think this shortcut New Year’s message is going anywhere (unfortunately). And I’m not dissing New Year’s goals – which can yield extraordinary long-term results. But put it this way – it’s a false promise. It’s easy to understand why a message like this once struck a chord; a new version of ourselves is a viable idea to sell. After all, the intention of reinvention isn’t bad. When the message was first deployed, it was catchy – it makes a memorable pitch in an alliterative package. But the reason it doesn’t work in version 100,000 is that apart from its overuse (deletable), we also intuitively know better. We know that our rate of change (or stagnation), is rarely instantaneous. Whether we want to admit it or not, we know that transformation happens in our minds first, and then everywhere else. We know that a steady drip, more than a cascade, is a more viable path to progress. I’d argue that we (customers, followers, audience profiles) would like to be given a little more credit when it comes to messaging, and that “New Year, New You” is tone def even for those of us who actually are the “you’s” making incremental healthy changes all the time. 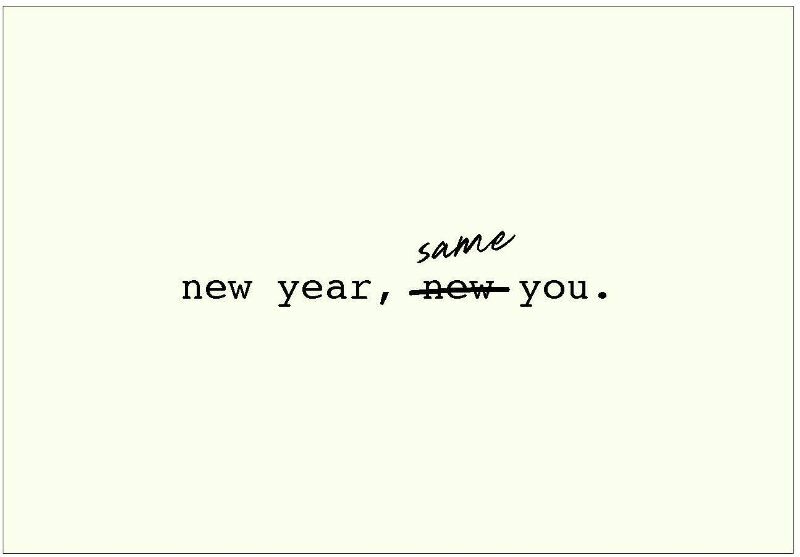 The reality is, New Year, Same You. Lots of potential in every second you’re on this planet is a better message. But it’s a terrible copy. Better language would reflect this knowing – and probably earn our attention (and maybe even our dollars), if it had this consciousness behind it. If the marketing team started there, I have higher hopes that a meaningful idea could be generated. This would also deliver conversions and customers, because even at our most fatigued (which is these days), a message that speaks to our true potential, that sees us in our real human experience, will always have a better chance than a prepackaged one.